It’s time, once again, for the Secret Recipe Club! This month my secret blog assignment was Cindy from Everyday Insanity. Cindy had a dream of an Easy Bake Oven as a little girl, and hey – so did I! (Okay, hands up if you DIDN’T want an Easy Bake Oven. No takers? Yah, I thought so.) Anyway, Cindy has been cooking and baking up a storm ever since, and she has lots of recipes on her blog to show for it. Now, typically, in the Secret Recipe Club, I’ve taken a recipe and modified it – usually a lot – to fit my food needs and preferences. This month, I was shooting for a gentler form of modification – slight tweaks instead of whole recipe overhauls. That cut out a lot of Cindy’s recipes. As delicious as Perfect Peanut Butter Cookies or Chocolate Zucchini Bread might be, we’re talking major overhaul for the GFDF crowd. There were some recipes, though, that I could have made without tweaking at all – like this Mango Salsa or this Pineapple Salsa. Both of those recipes are entirely raw and filled with wonderful fruits and veggies. Sadly, I’m not currently eating tortilla chips. And, salsa without chips might have just been a bit too torturous. So, I settled on a happy medium recipe – Crunchy Granola. The kiddo has been asking for some anyway. A few minor tweaks and I had a delicious gluten-free vegan breakfast option for the kiddo. Well, I DID have one. It’s gone now. She’s right about that making a double batch thing. Do it. You’ll thank me later. See what everyone else has done for this month’s Secret Recipe Club! If that’s not enough recipes for you, you can find more Slightly Indulgent recipes at Slightly Indulgent Tuesdays. This entry was posted in Blogger Community, breakfast, nuts, oatmeal, vegan. Bookmark the permalink. Great choice for SRC! I love granola! I also love to have it to put into yogurt! I agree with Angie, I’m always putting it in my yogurt, too. This’ll make a great breakfast or snack! I’ve been putting granola on top of really thick smoothies. Yum! Thanks, Kelly! Glad to be in the group with you, too. Thank you Deanna for the kind words! I’m glad you got to visit my blog, and I’m really happy you found something you could make! This granola really is excellent, I like to make a batch or two and give it as a hostess or birthday gift. It looks pretty in a recycled jar or a cello bag with a big bow. And who doesn’t like some homemade granola. I think I’ll make some now. You’re welcome! It was fun to read your blog and this recipe is DEFINITELY a hit in my house. I should try your other granola recipes, too. Ohh man, salsa without chips WOULD be a sad, sad thing. Granola recipes have been popping up everywhere–I think it’s a sign that I need to make some of my own. I’ve been putting salsa on salads occasionally – and that’s yummy and works. But, yah, chips. I love chips. *sigh* Too bad they don’t love me, eh? Yum, the flavors in the granola look wonderful! Great looking and sounding granola, I’ll have to give it a try as we adore granola and I’ve never made my own. 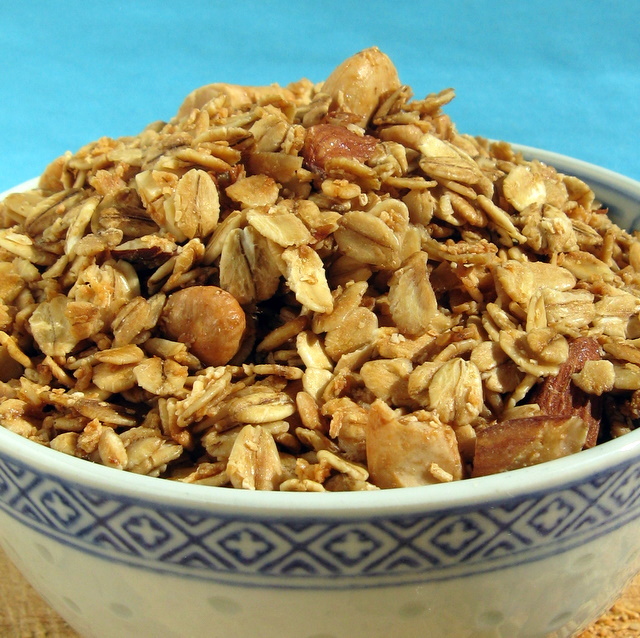 I’ve been looking for a granola recipe to try, and this one looks great! Thanks! I’m for putting granola in yogurt and I use it as crumb toppings for muffins and apple crisp and, ok so I love granola. Honestly as much as we eat it I should make my own. My mom’s coming to visit so this gluten free version would be perfect for her. I bet this is delish with that almond oil. I love granola and need to make a new batch soon. I will give this a go. Great SRC post. I love the idea of using almond oil for flavor…brilliant! Deanna … I love granola, love love love it. I second the brilliant use of almond oil! And … loved my EasyBake Oven! : ) Thanks for conjuring up that memory. Thanks for commenting over at Williams-Sonoma. Much appreciated. Deanna, forgot to ask … would you be interested in doing a guest post on my site? We cook much the same and I would love to share you with my readers. Maybe even just recycle a seasonal post from last year to make it easy?